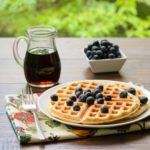 A recipe for buttermilk sourdough waffles. Buttermilk and sourdough starter are used to make these fluffy waffles with a special taste. Stir down your unfed starter and remove 1 cup. In a large bowl, add the 1 cup starter, flour, sugar, and buttermilk. Stir to combine. Cover loosely and set on the counter at room temperature overnight. Pre-heat your waffle iron before mixing the batter. In a small bowl, add the eggs and oil and whisk to combine. Pour the mixture into the bowl with the sponge. Add the salt and baking soda and stir to combine. Batter will begin to bubble. Spray or grease your waffle iron. Pour batter on the preheated waffle iron and bake according to the manufacturer's instructions. Serve waffles immediately or keep warm on a rack in the oven on the lowest heat setting. Serve with your favorite waffle toppings and sides. Amount of waffles can vary depending on waffle iron size, shape, and style (traditional, Belgian, square, or round).